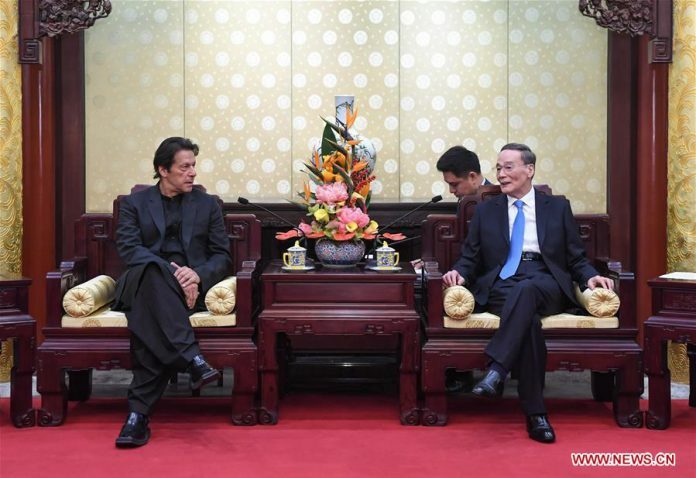 BEIJING, Nov. 4 (Xinhua) — Chinese Vice President Wang Qishan here on Saturday met with visiting Pakistani Prime Minister Imran Khan. Wang said that Pakistan is China’s only all-weather strategic cooperative partner. The friendship between the two countries has stood the test of time and has always enjoyed strong vitality. China will continue to place Pakistan in the priority direction of neighboring diplomacy, said Wang, pledging to work with Pakistan to maintain frequent exchanges of high-level visits and meetings, strengthen strategic communication and further enrich and expand the China-Pakistan Economic Corridor construction. Wang said that China expects to strengthen communication and coordination with Pakistan on major international and regional issues, jointly safeguard the rules-based multilateral system, and constantly strengthen all-weather mutual trust and all-round cooperation so as to build closer community with a shared future between the two countries in the new era. Khan said that Pakistan is deeply proud of the bilateral friendship and always adheres to a friendly policy towards China. He said that the Pakistani side admires China’s achievements in reform and development and looks forward to learning from China’s experience in governance, strengthening coordination with China on international and regional affairs and continuously enriching the all-weather strategic cooperative partnership.